Jazz singer DJ "Jazz" Holiday over the years performed with some notable groups and was a regular presence every Thursday night at Bert's Marketplace in Eastern Market where she'd sing Billie Holiday songs. She hit many bumps over the years, wrestling with mental health issues and poverty, but also had her successes, playing at one time with the Detroit's noted jazz group, Tribe. She released her first and only CD last year titled "Before I Go." On Feb. 12, she died of a heart attack, spurred by freezing temperatures in a vacant home on Detroit's west side a friend had left her. It had no electricity or running water. She was 74. Bill Meyer, a musician who has performed regularly for years at Bert's, and knew her well, says she was was "one of Detroit's greatest unknown singers." 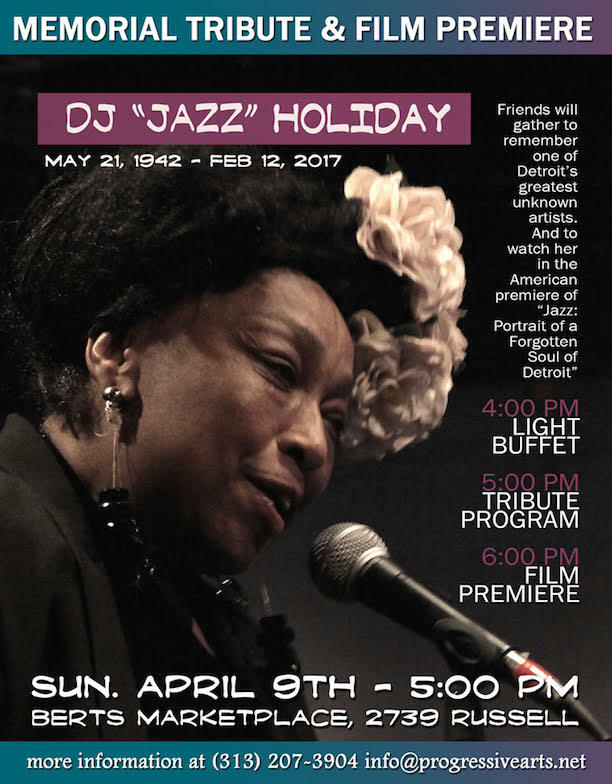 On Sunday, April 9, there will be a memorial tribute at 5 p.m. at Bert's, 2739 Russell, followed by the U.S. premiere at 6 p.m. of a documentary titled: "Jazz: Portrait of A Forgotten Soul. " A light buffet will proceed the memorial at 4 p.m.
"She never was in the music world for fame," Meyer tells Deadline Detroit. "She sang because she wanted to express her feelings through her music." Also known as Jamila Bowden, Jazz Gordon and Dr. Jazz throughout her many years of performing, DJ plummetted from a promising career in music. At one time she sang with Detroit’s iconic jazz group, Tribe, and was nurtured by club owner Bert Dearing and prominent jazz artists, including Marcus Belgrave, Charles Gabriel, Wendell Harrison, Phil Ranelin, and many others. She had 2 daughters with Motown songwriter Joe Bowden, but then her life took a serious decline. Meyer explained that she hit rock bottom in the 1970s, giving up custody of her two children. Her oldest died as a teenager in New Jersey, and the youngest, Honesty, lost contact with her mother until she discovered her CD online. He said Honesty will appear at the Memorial. He said one story is that she was abused by a boyfriend in the 1970s. "She was a very open, kind person," he said. "Very easy to take advantage of. She loved people." A couple years ago,a French film team discovered DJ at Berts and included her music in a film called Resilience, about Detroit and its struggle to recover from bankruptcy. Meyer recalls that Director Arno Bitschy was taken by her situation and "unrewarded talent" and returned with a film team last year to produce a documentary about her life. The documentary premieres this week in Paris. She's called Jazz. With a broken voice worn by life, she sings every Thursday at the same club, for the same customers, in Detroit. Though the city is one of shadows, of fates lost, of forgotten glories and talents unknown, between the gutted factories and houses in ruin is found the soul of the city, its very essence - rough diamonds ready to shine for those who know when to pay attention. A shadow like all the others, Jazz is a lady who doesn't know her age, who arrived in Detroit more than 40 years ago, without reason, without choice...just destiny. With her music being the single marker in a life of misery, Jazz sings to exist. Living in an abandoned house that a neighborhood friend left for her, Jazz seeks food at the popular soup kitchen on Tuesdays. And on Thursdays, she sings jazz at Bert's, putting on a sequinned dress, a crimped wig, jewellery, necklaces and makeup. On stage, where she's known as DJ Holiday, Jazz sings her two Billie Holiday songs, her voice both rough and sublime, evoking the mysteries of this great city.